When you’re given a business card at a craft fair, what do you do with it? I appreciate a well-designed business card and know how much thought, time and money small businesses put into them so I would feel guilty if I just tossed them out. I actually have a really cute box in my office that holds all the cards I’ve been given by handmade businesses over the years. I am not the norm. 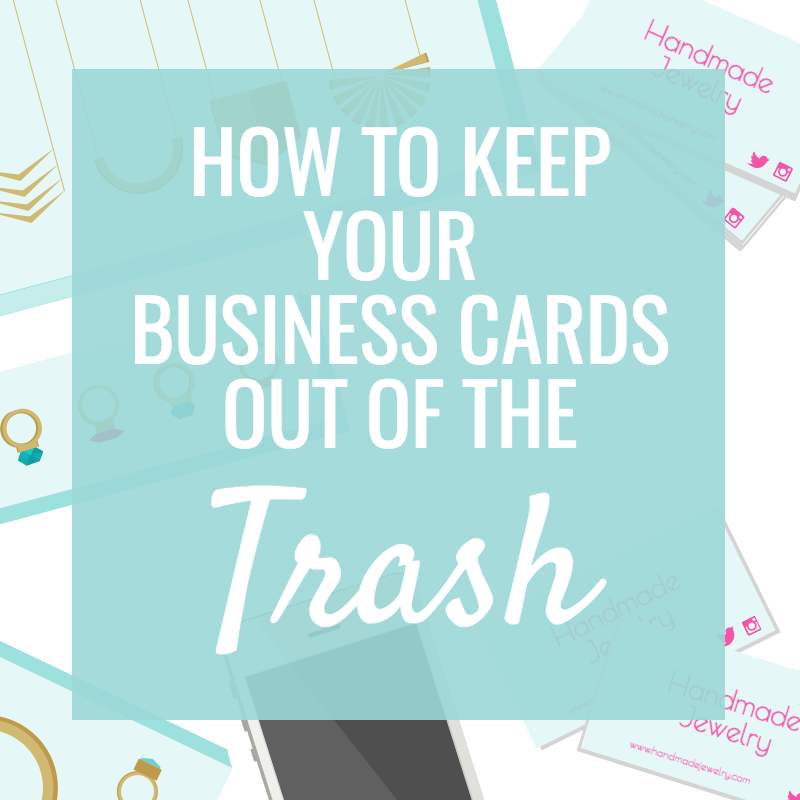 Over 80% of people toss the business cards they’ve been handed. Even with the respect and safekeeping I give business cards, guess how often I look in that box? Almost never. We’re connected to technology and so we no longer reach for the Yellow Pages when we need a business’ phone number; we go online. You’ve got a website, social media pages and perhaps an Etsy shop. These will all help increase your visibility online when someone types your business name into Google’s search bar. But the purpose of handing out business cards is to stay at the top of our (potential) customers’ minds and keep our contact info at their fingertips. They’re to be picked up and put into our pockets, wallets or purses. So how can you fill that purpose in a way that fits in today’s digital age?…..
Get your business card on people’s phones. We’re always connected to our phones. They’re in our pockets or within reach and are the first thing we grab when we need information but are not next to our computers. So getting your business’ information onto people’s phones rather than handing out a card is a great way to help them remember you and to save costs. How can you get your business info onto peoples’ phones? 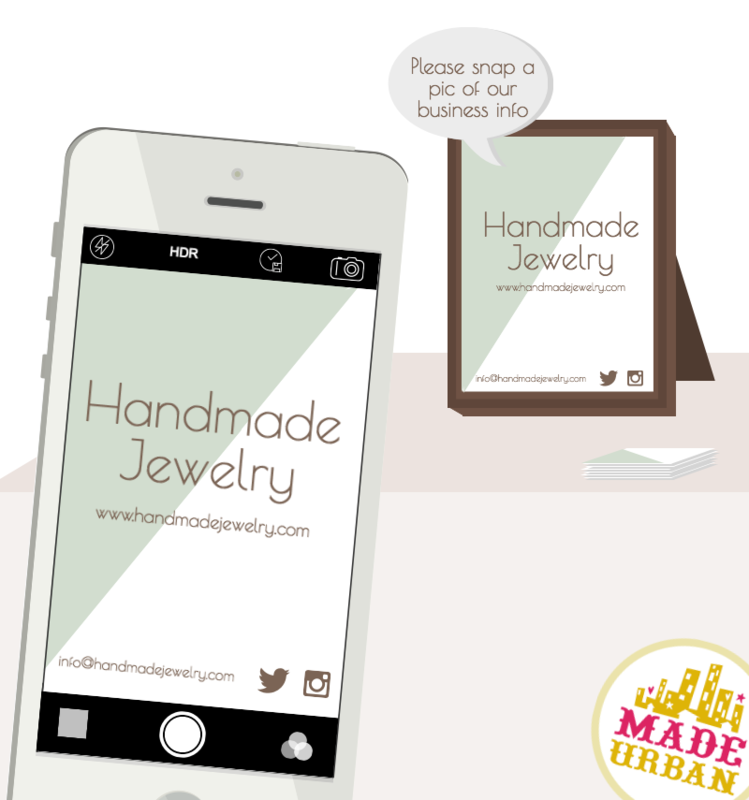 Instead of handing out business cards at your next craft fair, get shoppers to snap a picture of a sign that’s an enlarged business card. You could set it in a frame (glass removed to reduce reflection) or mount it on some foamcore and hang or prop it somewhere in your space. You can also use foamcore to add a note on a cutout that prompts people to use their phones and snap a picture instead of taking a card to reduce waste, costs and keep your information handy. I’m constantly looking in my phone’s photo albums…..mostly to check out photos of my cat, but the point is, I’m way more likely to come across your business if it’s on my phone rather than in a box in my office. If you want people to think of you next time they’re in the market for the products you make, your business needs to be top of mind. And the way to stay top of mind is to stay in view. This is the reason companies pay a lot of money for advertising. Brands don’t expect you to jump off the couch to run out and buy their product after seeing their commercial. But they know if you see their products and hear their name enough, they’ll be first in your mind when you are shopping. Think about one of the least interesting things to shop for: insurance. If you had to look for a new insurance provider, who would you think of? I don’t have a clue what’s out there aside from GEICO and State Farm. They instantly come to mind due to the sheer number of times I’ve heard their slogans and jingles, seen their mascots and laughed at their commercials. They’ve stayed in sight. Your business needs to be seen after the craft fair and what better way than to get onto shoppers’ phones? I would suggest keeping a few business cards to hand out to those who don’t have a camera on their phone or to include with your purchases. The business card sign will be a fun way for your shoppers to interact with your brand, attract some attention, save some money and stay in view. Check out another version of this idea that simply uses a regular business card and adds a note next to it. And if shoppers don’t take a card or snap a pic? Well hopefully you’ve created a business, products and a display that shoppers remember. You’ve gotta make sure you’re not just another jewelry, soap or scarf vendor. You’ve gotta become THE jewelry, soap or scarf vendor selling…..well, what is it that makes your business unique? Get the FREE worksheets and guide that will help you create a memorable business and display. 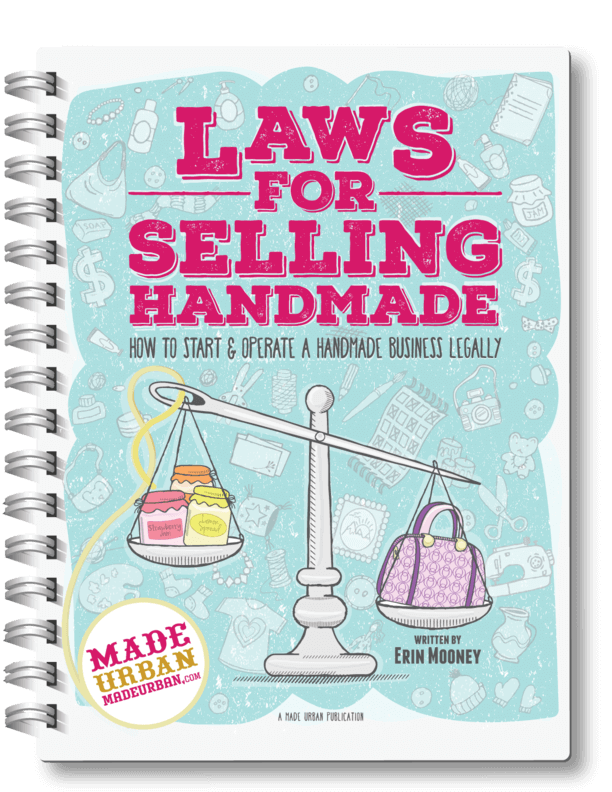 From finding your USP (unique selling angle – unfortunately being handmade or made by you isn’t unique enough, check out 3 MISTAKES HANDMADE BUSINESSES MAKE WITH THEIR USP), defining your brand, determining the story you want to tell that will stick in shoppers’ brains and encourage more sales, to grabbing attention and perfecting your sales pitch, you’ll find it all in this FREE challenge. Think of it this way; if a shopper didn’t grab your card and contacted the event organizer to find out your company name, could they describe your products and brand in just a few words? For example, a jewelry vendor with the white and teal booth selling only turquoise pieces. The soap vendor whose booth looked like a candy factory and sells candy scented soaps. The scarf vendor who uses cruelty-free wool. If you immediately remembered GEICO’s commercials when I mentioned their name earlier, it’s because you made a connection with their brand. You may not have a strong connection with auto insurance….most people don’t….that’s why they’ve created a connection with people another way: through humor. You also don’t want to leave everything in their hands. Even if a shopper were to pick up your business card and hang onto it or put your business info in their phones, it still leaves you sitting by the phone…..well email, waiting for their message. Make sure you use the tip in this article too so you have a way to get in touch with them. Another idea is to put a coupon on the back r a punch system. We have had great sucess for many years from having special business cards printed up with a $10 forever value on the back. We hand write a code consisting of letters and date on the corner so we know which trade show and mo/yr it was issued for our records. When the customer visits our shop we deduct the $10 from their total purchase no exceptions. No quilter will throw away $10 worth of supplies. 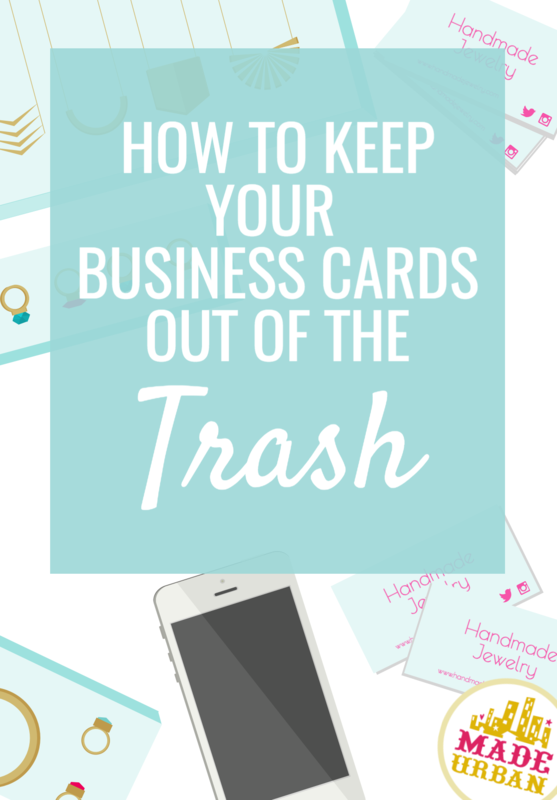 Turning your business cards into punch cards is a great idea too Leean! I buy a ream of cardstock for $5 and print off 2500 business cards to hand out and engage customers. I keep my nice printed ones for paying customers and card collectors (at comic cons it’s a thing). I usually only hand out that entire ream at most at conventions and I throw that $5 into advertising cost. I used to get upset when people threw my cards on the ground but I’ve now made it a game at conventions. I also try to look at it like this: a person with no intention of entering a vendor hall at a convention sees my card on the ground of their hotel. Suddenly now I’m in their thoughts and they never stepped foot near my booth. And another trick I’m going to implement at my next convention is creating a QR code that links back to your social media. I have one for my instagram now and hopefully I will score hundreds of new users at every convention! I made bookmarks from designer paper that I had left over from a project. I added my contact information on the back. I hand these to people and they seem to like them. Also, cute hang tags are also a great way to market by including an email or website on each hang tag will get your product and your information into the homes of purchasing customers or the recipient if it was a gift. Hi Lori, Sandra and Diane! QR codes are a good way to add some interaction with your cards. Bookmarks are definitely something someone would hang onto. And hangtags are a good place to advertise your website and send your info home with people who buy. I do wood crafts. I’ve decided to try using mod podge to secure my biz card to the back of all of my work. They’ll always have my contact info and if anyone compliments their woodcrafts and asks where they found it…it will be right on the back! All really great ideas! Being new at doing craft shows I’m trying to figure all of this out… thx for the info. I make and sell Gingerbread Guy ornaments, kits and cards which I have the shape of my GGuys in a die. I printed off my business card like Lori does and I cut them into the shape of the Gingerbread Guy. The down side is that it’s a little time consuming and does not use every inch of the cardstock like square cards do but I’m hoping it will be unique enough to help people remember me and want to keep the card. I will be trying them out at my next show to see how well they are received and may only use them at shows for the uniqueness of them. Thanks for reading North2South Crafts 🙂 That’s a great idea, keep in touch and let me know the response to your gingerbread cards at your next event. I love the hang tag idea. I knew a lady that designed her hang tags so they would fold in the middle, with logo and name on front, other info on back, she punched a hole in the top (middle) and put the price on the inside! It looked very professional. (she made quilts). I took your advice about the business card sign. It worked very well at my last 2 shows this month. There are some great ideas here – I like the $10 off. One thing I have done with my business cards. I use them for hang tags also. They are 2 sided. One side has my logo and the other side has my contact info. On the side with the logo, I have a blank space at the end (the short side) so I can put the price. I put the contact info on the other side a little off center. That way if the item is a gift, the giver can cut off the price, but the receiver still has my contact info. I put instructions on how to use our product, so people pick them up so they can use the reference later. I love all the ideas here, too. I dig all of these ideas! Thanks folks! !